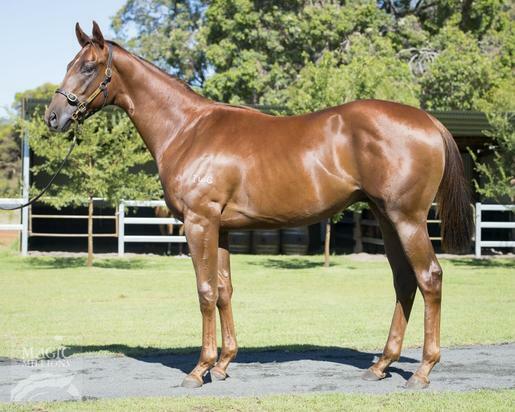 Check out our Gingerbread Man ex Brocky's Ace colt, purchased as Lot 34 at the Magic Millions 2018 Perth Yearling Sale. GINGERBREAD MAN (AUS) (Bay 2007-Stud 2013). 11 wins from 1200m to 1600m, Singapore Guineas, L, Singapore 3YO Classic, L. Out of a half-sister to SW Golden Snitch. Sire of 30 rnrs, 11 wnrs, inc. SP Achernar Star and of Essential Spice, Very Angry Gal, Goodluck Simba, Gingerella, Mystery Affair, Neurological, Toroteija, Bahama Mama, Pastry, Platinum Star and of the placegetters Smart Fox, Diamondanniversary, Rosebush, etc. QUILISTA (f. by Scandal Keeper). 8 wins to 1400m, A$578,300, to 2017-18, ATC Sapphire S., Gr.2, Birthday Card S., Gr.3, Bunbury TC Western Australian Breeders' Classic, L, VRC Melbourne Cup Tour Trophy, MRC Beveridge Williams H., WATC Heineken H., 2d MVRC Ladbrokes 55s Challenge H., WATC Kirin Megumi H., Corporate Membership P., 3d WATC Raconteur S., L, Budget Car & Truck Rental 2YO P., MRC Italktravel P., SAJC LUCRF Super Supports Jockeys H., 4th MVRC Carlyon S., L, Geelong RC Rosemont Stud S., L.
Brocky's Deal (g. by Balestrini). 6 wins-1 at 2-from 1100m to 2000m, A$155,530, WATC Westspeed Nursery H., Beer & Bourbon H., HMAS Perth Ships Company H., Tabtouch.mobi H., 2d WATC Perth Corporate Members H., Southern Habitat Wholesale Nursery H., Ascot Shamrockin Deck Party H., 3d WATC Perth Racing Security H., Racing at Belmont Park H., Westspeed Stayers Bonus H., Tabtouch With Cash H.
Boutique (f. by Discorsi). Winner at 2050m, 2d WATC Magic Millions Raceday H., Perth Racing Youtube H., MPA Skills H., Book a Table Flying Colours H., Belmont Bonanza $20 Offer H., Sponsor a Race H., 3d WATC Westspeed Nursery H.
Peter Perfect (g. by Oratorio). Winner at 1300m in Aust. Confidence (g. by Bletchley Park). Placed at 3, 3d Singapore TC Generosity S.
Brocky's Ace (Surtee). 3 wins. See above. Hot Ego. 3 wins from 1200m to 1600m in Malaysia, Perak TC Da Ma Cai Malaysia 3YO Championship (Heat 2). Brocky's Gamble. 2 wins. See above. Twice the Speed. 2 wins at 1200m, 1400m, 3d WATC Pago Mystery H.
Laspoia. Winner at 1600m in Aust. Good Success. Winner at 1600m, Singapore TC Benchmark 48 H.
Scartrice (Scarlet Man). 3 wins-1 at 2-at 1100m, 1150m, WATC Rentokil Property Protect H., 2d WATC Florabel H., San Toy H., 3d WATC Ngawyni S., L, Gascoyne H. Producer. Record Attempt-Amazing (Mal ). 7 wins at 1200m in Malaysia and Singapore, Perak TC Class 1 H.-twice, Singapore TC Restricted Terms, 2d Selangor TC Class 1 H., Singapore TC Restricted Terms. Real Cheeky - Sichuan Hero (H.K.) (Real Jester). 4 wins-3 at 2-from 1000m to 1650m, A$139,775, HK$500,000, WATC Budget Car Rental 2YO H., Total Wine Solutions 2YO H., Originial Sin 2YO H., HKJC Wong-Nei-Chong S.H., 2d Western Australian Guineas, Gr.2, WATC TJ Smith Trophy, L, 3d WATC Supremacy S., L, HKJC Tai Lam Chung H., Shek Wai Kok H.
XANADU (Elusive City). Joint Top Filly on the 2012-13 NZ 3YO Free H (1600m+). 6 wins from 1200m to 1600m, NZ$532,225, A$3,500, Hawkes Bay Windsor Park P., Gr.1, Te Aroha JC New Zealand Thoroughbred Breeders' S., Gr.1, BOP RC Triton Pacific Owens P., ARC Stella Artois 3YO Mile, 2d WRC Telegraph H., Gr.1, Hawkes Bay Makfi Challenge S., Gr.1, Waikato Draught Sprint, Gr.1, Otaki Maori RC WFA S., Gr.1, Waikato RC Foxbridge P., Gr.3, 3d Hawkes Bay Windsor Park P., Gr.1, Te Aroha JC New Zealand Thoroughbred Breeders' S., Gr.1, Waikato RC Foxbridge P., Gr.3. VEROSSI (Verglas). 4 wins at 1600m, 1800m, A$159,650, WATC JC Roberts S., L, 3d WATC Challenge S., L.
LIM'S OBJECTIVE (O'Reilly). Champion 3YO in Singapore/Malaysia in 2007. 8 wins from 1200m to 1800m, S$931,498, Singapore TC 3YO Challenge (1st Leg), L, Raffles Cup, L.
BRORAMA STAR (Brocco). 13 wins from 1200m to 2400m, A$277,215, TRC Hobart Cup, Gr.3, Purity Ingham Jockey Club Cup, TTC Longford Cup H., 2d Mornington Cup, L.
ZERO DRAMA (Danzero). 7 wins from 1400m to 1800m, A$409,100, Kilmore Cup, L, MVRC Geoff Torney Cup. GOOD CONTROL (Fasliyev). Horse of the Year in Macau in 2008-09. 12 wins to 1300m in Macau, Macau Lisboa Prelude, L, Summer Trophy, L.
PHANTASMAL (Alzao). 11 wins from 1200m to 2200m, A$222,130, WATC York H., L, 2d WATC Winter Cup, Gr.3. MY FIRST AFFAIR (Afleetaffair). 6 wins at 1200m, 1400m, A$173,900, QTC Bright Shadow H., L, 4th QTC Juanmo H., L.
GREAT TROOPER (Moss Trooper). 10 wins from 1500m to 2400m, A$84,250, WATC Premier's Cup, L, Birthday Cup.